I don’t know what has gotten into these people, but it would be funny if it were not so serious. First, the Pople comes out and thinks that if we just ban weapons there will be no more fear of war. Then a teacher from Marjory Stoneman Douglas High School referenced student Kyle Kashuv as “the Hitler type” in a discussion with another student about the discussion that took place on Twitter between the teacher and student. If you recall, just last week, I reported on the fact that the cowards in the Broward Sheriff’s Department, as well as the school resource officer, confronted and interrogated Kashuv after he went to a gun range and posted all he learned on Twitter. It seems that the only people the cowards in Broward have any courage to confront inside a school is an unarmed kid. So, what’s going to happen to Pittman? Right, Ms. Drew. How seriously are you taking the harassment of Kashuv by the school’s armed school resource officer and the Broward County sheriff’s deputy last week? How seriously will you take this latest incident? The public surely can’t have any confidence in the leadership there in Broward County. As for Pittman, he tried to justify the school’s actions of interrogating Kashuv. However, no, I don’t understand why a kid who has defended the law, the Second Amendment, should be interrogated. He committed no crime. He assaulted no one. He threatened no one. IF anything, he informed the mush brain, non-critical thinking kids like David Hogg and Emma Gonzalez from the school about what the Second Amendment is about and why it is necessary to protecting God-given rights of the people to keep and bear arms. There was no need to ask questions. 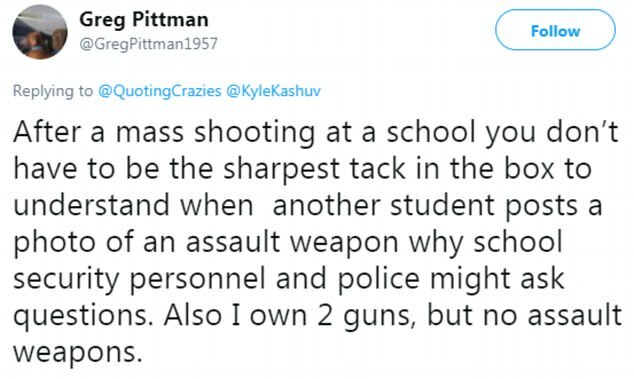 What is amazing is that Pittman doesn’t question those same people as to why Nikolas Cruz was not arrested and charged after numerous threats and assaults, but he doesn’t do that.